A collection of short comic stories spanning through animated films Disney/PIXAR Toy Story 1, 2, and 3! Set your jets for adventure. Join Woody, Buzz, and all of your Toy Story favorites in a variety of fun and exciting stories. 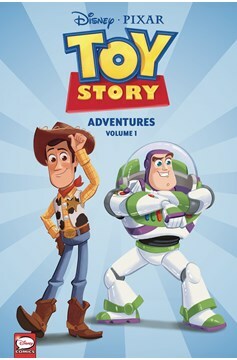 Get ready to play with your favorite toys with Andy and Bonnie, join the toys as they take more journeys to the outside, play make-believe in a world of infinite possibilities, meet new friends, have a party or two-experience all of this and more in this collection of Toy Story Adventures Volume 1! Collecting well over 200 pages of Disney/PIXAR Toy Story comics, this graphic novel brings the adventure, comedy, and heart of Toy Story from the screen to your fingertips..